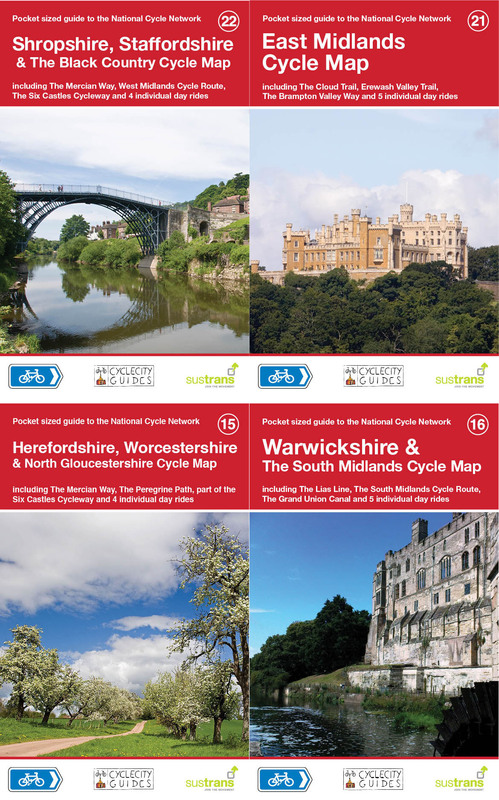 Our new series of cycle maps of the National Cycle Network, produced in collaboration with Sustrans, has now reached the Midlands., Four new maps cover from the Welsh borders in the West to the cities of the East Midlands in the east. The series now reaches from Cornwall to Nottingham – the most comprehensive set of cycle maps since the boom days of cycling in the 1950s. We have also reprinted new editions of the Cornwall and Somerset Levels maps as the first editions in these areas had sold out. The Thames Valley and Severn and Thames maps have already been reprinted. The new maps are: Herefordshire, Worcestershire & North Gloucestershire; Warwickshire and the South Midlands; East Midlands and Shropshire, Staffordshire and the Black Country. Collectively they cover some of the best cycling to be had in the country, with much of the network easily accessible from the region’s main urban areas. The pocket-sized maps at a scale of 1:100, 000 are proving very popular and together with Sustrans we have plans to complete national coverage by the end of 2015. This entry was posted in Uncategorized and tagged bikes, cartography, cycle touring, cycling, East Midlands and Shropshire, Herefordshire, long distance, mapping, maps, National Cycle Network, ncn, Staffordshire and the Black Country, Sustrans, Warwickshire and the South Midlands, Worcestershire & North Gloucestershire. Bookmark the permalink. Could you post some examples of what the mapping looks like please. Most interested to see / get one these for Lancashire when you get this far North. Hello, thanks for the comment. We have an example of the mapping on our website. Follow this link http://fourpointmapping.co.uk/shop/shop/maps/cornwall-cycle-map/ and under the coverage map there is link you can click which will show you an example. Hope this helps and we hope to get up that way soon as we are planning on doing nationwide coverage. Hello Elizabeth. You can purchase these maps from the Sustrans shop.